This year I went to two Berlinale films, both in the Forum (young experimental) section, both with a literary twist. 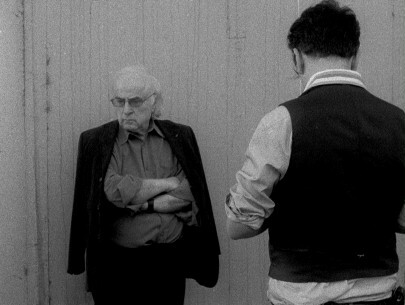 One is the experimental pseudo-documentary Le Beau Danger by René Frölke which (quite literally) follows Romanian-Jewish writer Norman Manea in his public and private life. The other is a tragicomedy about and featuring French writer Michel Houellebecq as he is kidnapped, which is supposed to explain Houellebecq’s mysterious disappearance in 2011; the film by Guillaume Nicloux is unsurprisingly called L’enlèvement de Michel Houellebecq (The Kidnapping of Michel Houellebecq). In fact, despite the obvious differences (of genre and personae of the writers), I was baffled by the coincidences. Both Manea and Houellebecq, whose work is internationally acknowledged and translated, and who get a lot of attention from media, appear, in some moments, as victims (Houellebecq) or as implicit critics (Manea) of this very system. Frölke’s Le Beau Danger is, first of all, an experimental film, as it plays with the footage gathered while following Manea on his tours (to Italy or Argentina) and his revelatory trips back to Romania and Bukovina. It takes experiment with image and sound quite seriously, featuring silent and black and white fragments, sound collage, abrupt cross-references within the film; even so, it surprises most with its heavy emphasis on text, i.e. fragments from Manea’s works, alternating with the images (more on this later). And yet, from my perspective, it is also a critical film—perhaps the title, borrowed from the title of a book-long interview with Foucault, is significant in this sense, although on the surface it may misleadingly suggest an aestheticized view. In the interview (which has been translated into English under the title Speech Begins After Death), Foucault is provoked to define his attitude towards writing. While he concedes to indulging in a certain “pleasure of writing”, he still wants to claim that his writing is transitive, diagnostic, and thus critical. This tension between the spell of belle-lettres and the obligation of a critical stance could be applied to Manea’s work and to the film itself. Documenting the details of the various events at book fairs or interviews, Frölke, who shot everything himself, critically focuses and zooms in on usually neglected contextual elements. While Manea is interviewed by an exuberant host who acts talk-show-like, Frölke suddenly switches to the audience gathered near the mini stage—some listening, some distractedly looking around or fanning themselves with some sheets of paper. But the real “jewel” of the scene is the conspicuous microphone attached to the host’s head. Technology becomes a target in the film, and one could read this as a critique of “mediatization” itself. Setting up microphones for interviews, being interrupted because sound doesn’t work, checking of light etc.—all this surrounds what a natural conversation would be. However, Manea’s figure/presence remains surprisingly tolerant and open during all these interruptions. Although, as he explains, at some point, to a few students in Romania, it’s just that one gets used to it, accepts it (and one cannot simply reject it), what the film portrays, I believe, is a slightly ironic kind of resistance, of a warm rather than of a cynical kind. At some point, the writer abruptly turns to the camera following him. He jokes with the cameraman/director. The problem that the film explores is in what relation actually reading an author stands with respect to embracing his public image and being potentially distracted by it; how much one actually reads into a novel/an author. This is what generates, I think, the most radical part of the experiment in the film. Citing Manea’s novel “The black envelope” and the short story “We could have been four”, Frölke proposes, as he himself pointed out, an experience of collective reading, something we never quite do or expect when we watch a film, and something that is quite different from what a documentary on a writer’s life could be. One of these reading-fragments is—of course purposefully—quite long. And over 5 minutes is very long for a film. As the text kept appearing on the screen, a few people felt impatient and left; I heard the chairs creak and fold back. As one spectator observed at the end, this is what it means to live in a “fast culture”. One thing is clear: this was an experiment in the traditional sense, an experimental situation. And yet there is, I believe, a different, subtler critique in the film. It is related to what I see as a reflection on cultural memory (and traumas thereof). In a luxuriously suggestive scene captured in the Jewish cemetery in Mohyliv-Podilskyi (Ukraine) Manea is visiting, the camera insists on a few goats that are grazing among the sometimes upright, sometimes uprooted gravestones. The camera “reads” the various names written on the gravestones, but somehow the livelihood of the goats—who sometimes climb the gravestones—stands out. Animality is a theme throughout the film that accompanies the reflection, and one of Manea’s texts employed in the film—“We could have been four”—sustains this motif. And, surely, it could be read as a contrast with “culture” and with human memory, but to me it suggests that our memory is itself animalistic in its ruthlessness. That is to say memory is a violent and limiting choice with respect to all that really happened, violence with respect to truth. Memory is, undoubtedly, one of Manea’s main themes, as is exile and its repercussions on a writer’s fate and mind. For Manea, who currently resides in the US but writes in Romanian, this linguistic exile makes the writer a snail-like being, carrying its (linguistic) home. A highly symbolic moment that the film captures is when Manea and his wife Cella, on one of their trips to Romania, find a snail and take it with them, sheltered on a leaf. The film’s end shows us the snails (now two) peacefully living in Manea’s residence in upstate New York. Enclosed in their new environment (a salad bowl), they glide on the brim of the bowl with the tragic awareness on being on the brim of an abyss, towards each other, then suddenly meeting; their receptacles clashing, retracting, thinking, reuniting. In the background, Erik Satie’s Gnossienne 3 progresses in the same rhythm. A few seconds later, one of the viscous bodies is hanging in the air, close to falling, but by an acrobatic movement it manages to recover its stability. The two bodies clumsily cross each other, so to speak, and continue their paths, not quite knowing that it’s a circle. In the introductory scenes of The Kidnapping, besides drinking and smoking and planning to renovate his apartment, we see Houellebecq being constantly haunted by admirers and media. “I am tortured by the media”, he says (my translation). Everybody wants something from him and his work, including his Polish kidnappers, who later in the film engage in a violent dispute with him on a scene they think Michel has written—and he has not. The suspicion is that this is what caused the absurd kidnapping to begin with. And yet Michel, blasé and cynically calm and full of condescension, drinks wine and smokes on, drinks and smokes through (as one would sleep through) his kidnapping. And this is the shortest summary. Indeed, the virtue of the film and of Houellebecq as an actor is that Houellebecq is/stays himself, quite literally. Overall, the wild humor of the film comes from this very simple juxtaposition: our expectation of a kidnapping scenario vs. the sheer incompetence and amateurishness of the criminals and the sheer calmness of Houellebecq. At some point they discover that they don’t know who ordered the kidnapping. The liberation itself looks suspect, as if they just decided to release him without having actually received any money (although they speculate, quite humorously, that “Hollande could pay” for Michel’s liberation). Besides, they treat Michel as a very special guest, taking no precautions, and trying to impress him with their skills and life stories. One of them, who is a bodybuilder, takes his T-shirt off and shows him various bodybuilding poses; Michel is, of course, slightly amused, but he has to remain composed, or rather sporting a discrete smile which his perpetual tipsiness “feeds”. Another, who is a professional fighter, tries to teach Michel a few tricks. The very fragile Houellebecq complies, and tries to learn. His jacket folds like paper under his opponent’s body. The “lady” of the house they are all living in (in a secluded, camp-like village the location of which is impossible to identify) tells him about her life. In exchange for bringing Fatima, a girl who had been their “present” to Michel on his birthday, he even writes a poem for the host. All this is punctuated by grotesque—as when, at the birthday party, all the kidnappers and their hosts and Michel put on bizarre carnival masks—or sublime scenes—such as the closing scene, in which Michel, on the verge of being liberated, asks to drive the kidnapper’s car himself. He accelerates, really accelerates, and, with Chopin on the background, the film speeds away. Chained to the bed but able to start an affair with a prostitute (“it could be important” to bring Fatima back, he says); able to order his favorite wine for dinner; being overtly racist to the main kidnapper (a Gipsy) and finally confronting the latter in matters of (his own) literature—Michel is hardly a victim. He is the author, simply put. I am wondering whether all this is not an allegory of authorship, as Michel promises, at some point, to write a book about them. From yet a different perspective, even when Houellebecq is violently extracted, so to speak, from the public sphere, publicity stays with him.